Is Masoor Dal safe for diabetics? The glycemic index of masoor dal is low which makes it safe for diabetics to consume masoor dal in the form of curry, paratha, etc. as a part of your daily diet. Since the amount of carbohydrate found in masoor dal is complex, it is slowly released into the blood stream, thus manages your blood sugar levels. Masoor dal is an excellent source of fiber providing 3.1 grams in 30 grams of masoor dal, wherein insoluble fiber improves your bowel movements and soluble fiber benefits your heart. Is Masoor Dal suitable for weight loss? 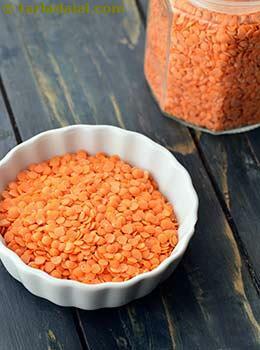 Lentils are the excellent source of low fat protein which makes it suitable for weight watchers. The amount of fiber in the masoor dal allows us to remain satiated for a longer period of time. Thus reduces daily calorie intake without remaining hungry.